Dunwall is not a place of honour. It is the decaying remains of a society which peaked in an unbalanced and terrible way. Death and disease fill the streets, stalk the sewers and support what remains of the ill-advised industrial complex. Residents either languish in the depths of their inescapable poverty or sit in their ugly ivory towers, denying those below even a proverbial slice of cake and ignorant to their own precarious position. The concepts of murder, corruption and grotesque hedonism are accepted as a widespread everyday occurrence. Yet, as a citizen of this funhouse-mirror reflection of Victorian-era London, Corvo Attano is curiously referred to as dishonoured. The social status of the protagonist in Dishonored is heavily dependent on your viewing angle, of course. At the most basic level, Corvo is a dishonoured individual because he is believed to have assassinated the Empress, which is a bad thing for anyone to do, let alone the person actually charged with her protection. The nobility of Dunwall—and any lesser citizens in the thrall of the city’s authority figures—see Corvo as a disgraced guard, a murderer and a traitor. But this is a fiction created by the architects of the real conspiracy, and if you subscribe to the idea that honour extends beyond the opinions of others—being good means doing the right thing even when nobody is watching, all that rot—then Corvo’s honour remains intact, separate from his reputation. Fakery on the part of the ruling class aligns with gameplay intentions. Corvo is rarely able to simple wander around an area due to not just his notoriety, but the shame associated with that. In any given Metal Gear, Splinter Cell or Hitman, the player and character both hide for the same pragmatic reason: self-preservation; in something like Assassin’s Creed, you saunter through the city with almost total anonymity, save for a few pockets of red on the minimap. Dishonored places you at thematic odds with the environment, forcing you into the shadows because of your perceived actions and their repercussions. Dishonored‘s title has other implications. Corvo is presented as an honourable man thrust into this filthy universe, and as such has his own implied perspective on events. From his point of view—and from the player’s—Corvo is a failure. He allowed assassins to kill the Empress and kidnap her daughter, in direct opposition to his sworn duty as protector. It’s important that the game forces you to play through this doomed sequence at the beginning of the game; Corvo’s struggle to fight off magical invaders becomes our struggle, and, as a result, his ultimate disgrace becomes ours as well. Had this been a cutscene instead of an interactive moment—one mercifully free from quicktime events—players would be forced to settle for the perfectly serviceable, yet rather lazy, promise of exciting gameplay in the future. Before this tragic sequence, we learn that Corvo was sent away to find out if foreign powers had discovered a way to deal with the plague. His empty-handed and hopeless return isn’t just a convenient way to have the character turn up and start the game as ignorant as we are about Dunwall’s situation; it’s yet more weight on the shoulders of a man who presumably just wants to save the city and its rulers. I say “presumably”, because Corvo is a protagonist of the unerringly silent and entirely faceless variety. 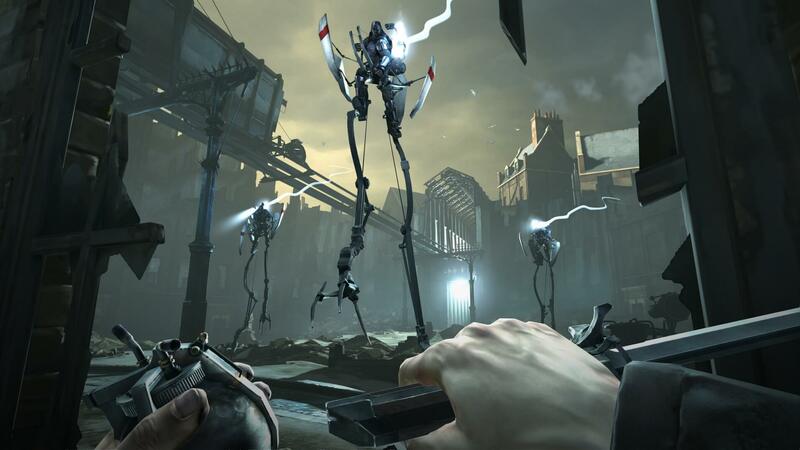 I would never suggest that Dishonored should have moved from a first-person to a third-person perspective—the stealth mechanics are quite possibly the best in the genre as it is—but the narrative paints Corvo as a character more complex than any camera on a stick could ever hope to support. If it were viable, the ability to see Corvo would ground him as a piece of the universe and emphasise the practical-yet-dehumanising mask he has to wear. The player is left to approach this setup in two main ways. 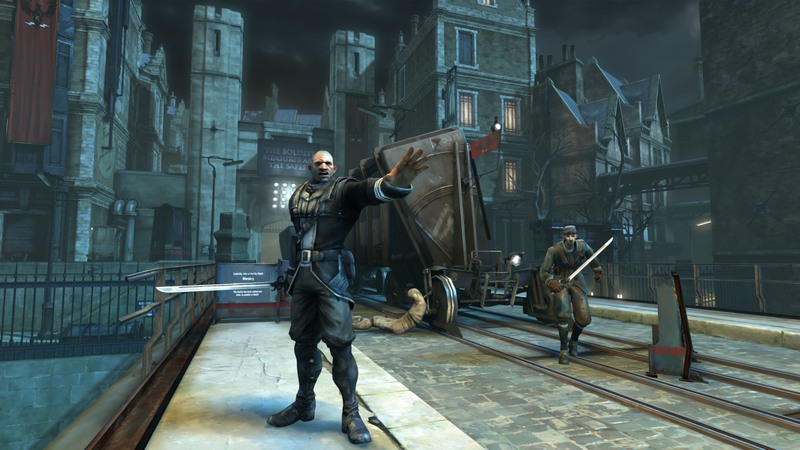 If you focus on the external factors, Dishonored is a story about revenge and justice; exacting punishment on the wicked and restoring Dunwall to its former glory, more or less. In this version, Corvo is an instrument to be turned against the likes of the Spymaster and High Overseer. His actions are self-evidently just and correct. Interestingly, this righteous thinking seems to better suit a chaotic style of play, leading the player down more deadly and violent paths in the name of an equally dead Empress. Whatever it takes. If you do follow the chaos in the game, of course, it leads to even more darkness; more rats, more plague and less happiness for everyone. If one chooses to motivate internally, you find yourself in an entirely different mental space. With Corvo’s personal demons and he and the player’s shared sense of responsibility for events, Dishonored becomes a tale of redemption. Not necessarily the act of being redeemed, but the journey one goes on to reach and deserve such cosmic forgiveness. Corvo screwed up, essentially, and the game recounts your attempts to fix it. Sneaking, minimal violence and an eye for a Dunwall that can move away from death and corruption become the more logical choice over instant gratification. Dishonored‘s collection of scary magic powers—and the lore which stands behind them—reflect a similar difference in philosophy. Corvo accesses all sorts of otherworldly abilities thanks to a deal with The Outsider, a Lucifer-like benefactor who appears to certain people and gives them power without imposing any sort of mission or viewpoint. The Outsider presents himself as a neutral force for the most part, but the citizens of Dunwall paint him as a rather malevolent chap, and it’s hard to see anything particularly ambiguous about sending a swarm of rats to eat your victims alive. Still, it is Corvo’s choice to use such gifts, The Outsider says as much, and the game can certainly be completed without using the morally questionable ones. Perhaps it is yet another test of the ball of tangled yarn that is Corvo’s honour system; if you put a gun in a man’s hand and present the opportunity to achieve his goal, is it wrong for him to use it? Is the responsibility now shared? It’s unclear if The Outsider’s little presents serve to further isolate Corvo or simply highlight his existing isolation. The pulsing, psychic heart which you are saddled with early in the game reveals the innermost thoughts and secrets of those around you, and, notably, Corvo is the only person you can never turn the heart towards, perhaps because it would have nothing to say. The things that Corvo does—even before the game begins—set him apart from the rest of society. It’s between missions, when you can explore the Hound Pits Pub, that you get an idea of exactly how far Corvo Attano is from the average person in Dunwall. The maid, maintenance people, scientist and every other incidental soul go about their confined and stressful lives; even the Admiral gets in a spot of target shooting between political plots. But Corvo can only watch, because his work is physically, emotionally and thematically separated from even the strange lives of those in the resistance. He is the whaler, and they are the whales. As well as all the empire-toppling, slitting of throats, animal possession and government resistance, Dishonored is the story of a man who has become detached from his world view, and separated from what he believes makes him who he is. While the first-person perspective and silence from Corvo makes him hard to relate to as a character, perhaps it’s an intentional choice; the distance allows us to see him objectively, as a man who gets things done. And maybe that practicality makes him the most dishonourable man in Dunwall. Even villains have a code.